The great majority of experiments on animals in Britain have been performed in the name of medicine, yet ethical objections to vivisection came originally from doctors, who felt it brought their profession into disrepute. The recent debate on animal experimentation has focused on utilitarianism and animal rights to the exclusion of virtue ethics, but concerns about the character of the experimenter and whether vivisection was of overall benefit to society were fundamental to the development of the anti-vivisection movement. In Britain, the great majority of vivisection—I use the term not just in its literal sense of cutting up living animals but in the broader one of experimenting on them to the extent that they suffer and perhaps die—has been performed in the name of medicine. 1 It is of historical interest, therefore, that, in the mid-nineteenth century, when vivisection was introduced into British laboratories and medical schools from the Continent, much of the opposition to it came from doctors. Their motives in resisting it were complex, but can be boiled down to a conviction that vivisection was not something that a doctor ought to do. In writing a book for a series on animal ethics, I am labouring under a disadvantage in not being an ethicist. Most doctors are in the same position, and in the past 20 years or so a cadre of professional medical ethicists has arisen to guide our thinking. This has not been unproblematic, since few are trained in medicine and almost none practice it. While clinicians have benefited from the input of academic ethicists, some of their contributions have proved controversial, and occasionally shocking, such as the recent paper in a leading British journal of ethics that seemed, certainly to the readers who contacted the journal to complain, to be advocating infanticide. Its perspective was, needless to say, utilitarian. 3 The resulting outcry apparently surprised some members of the academic community, especially since, as the journal’s editor observed, arguments in favour of infanticide had previously been put forward by ‘the most eminent philosophers and bioethicists in the world…’. 4 Of course, it is not to be supposed that these luminaries would be anything other than horrified if their theorising actually led to children being killed, but the furore does reveal the gulf between ethical theory and practice, and, since the latter is influenced by the former, serves as a reminder that how ethics is taught matters. Bioethics as currently taught in British medical schools is unlikely to stress the importance of the physician’s humane character 5 : as anyone who works in a teaching hospital will know, medical students and junior doctors are trained to seek the greatest benefit for the largest number; and to their utilitarian hammer, everything looks like a nail. There is very little in this book on the subject of animal rights, since while the concept has a long history, going back at least as far as Thomas Tryon (1634–1703), 7 and while parallels between the rights of man and the rights of animals helped put animal welfare on the political agenda at the end of the eighteenth century, rights-based arguments were seldom used by the anti-vivisection movement before the 1970s. It was only after the publication of the Oxford philosophers’ collection of essays, Animals, Men and Morals in 1971, followed by Animal Liberation (in which Singer himself does not take a rights-based position), that the anti-cruelty movement regrouped under the banner of ‘animal rights’, and began to appeal primarily ‘to reason rather than to emotion or sentiment’, a significant departure from what had gone before. 8 Rights-based arguments have certainly caught the public imagination, to the extent that non-specialist publications typically refer to anti-vivisectionists as ‘animal rights activists’ as though the two are synonymous, with the result that the principles on which the movement was founded are prone to be overlooked. As Andrew Linzey has written, an idea that has generated as much scholarly activity as animal rights cannot be unimportant, but merely respecting any rights that animals are deemed to have falls far short of the ideal of treating them humanely, an ideal that was at the heart of the original anti-vivisection movement. 9 This history will explore the ethical arguments that sustained that movement from its beginning and throughout its heyday: namely, that it is socially irresponsible to permit cruelty, that Christianity, and other faiths, require animals to be treated as more than means to an end, and that a balanced, holistic approach to medicine must draw on emotional and spiritual insights as well as on the results of experiment. It is possible that some will turn to this book for an answer to the question of whether animal experimentation has in fact resulted in significant medical advances. In this, as in other aspects of the debate, the propaganda has been extreme: supporters of vivisection have laid claim to almost every major medical advance of the twentieth century, while their opponents argue that nothing useful has been learned. The truth lies in between, though it is difficult to say precisely where, as just because a particular advance was made through vivisection does not mean that it could only have been thus made. Since vivisection has been normative, or even compulsory, in laboratories for over a century, it has necessarily played a part in most of the important discoveries made during that time, but whether they would have been made without it is as difficult to answer as any question in hypothetical history, and I shall not attempt to do so here. It is notable that historically, while the claim that vivisection has resulted in key advances in medicine has been a critical one for its supporters, for many anti-vivisectionists it was irrelevant, since the issue for them was whether vivisection benefited society as a whole, the answer to which depended on a sophisticated socio-political value judgement of what makes for a good society. So prominent was the culture of the laboratory in the late-nineteenth century that trials on ‘suffering human beings’ were dismissed by the British Medical Journal (BMJ) as inferior to experiments on animals. 10 Like human dissection half a century earlier, vivisection was controlled by legislation, restricted to professionals, confined to licensed premises, and performed out of the public gaze, and though its practitioners were disliked and sometimes feared by the public, they were also admired for their fortitude and commitment to the pursuit of science. If medical progress required experiments on animals, then the scientist’s cool indifference to vivisecting them signified dedication and self-mastery rather than callousness or cruelty. By the early-twentieth century, vivisection had come to be seen as an indispensable weapon in medicine’s unending ‘fight’ against disease: to be pro-vivisection was to be for science, progress, and the relief of human suffering, while anti-vivisectionists were enemies of science, whose sentimentality and squeamishness were obstacles to be overcome. To understand the motives of anti-vivisectionists, one must first appreciate the fundamental differences over the nature and goals of science that lay (and perhaps still lie) at the heart of the debate. I have laid particular emphasis on the thesis that vivisection was the expression of a particular view of science—objective, dispassionate, materialistic—which has now become so familiar it is largely taken for granted, but which was contentious in its time. Anti-vivisectionists also regarded themselves as scientific—they tried to test their position through experiments such as anti-vivisection hospitals—but their idea of what constituted scientific sources extended beyond results acquired in the clinic and laboratory to encompass less palpable forms of knowledge. To them, a scientist’s duty was not simply to investigate physical phenomena but to seek a deeper appreciation of their significance and, by paying attention to ethical and social considerations, to increase the sum of human wellbeing. Our own [i.e. the experimenters’] verb of life is εργαζεσθαι [to work], not αισθανεσθαι [to perceive]. We have to think of usefulness to man. And to us, according to our standard of right and wrong, perhaps those lackadaisical aesthetics [of anti-vivisectionists] may seem but a feeble form of sensuality. Of course, not even Mr Simon could entirely numb himself to suffering: he went on to say, without irony, that he found vivisection ‘painful’. 12 For all their talk of objectivity, many experimenters found themselves in a similar position: according to Rob Boddice, Victorian physiologists used anaesthetics to spare their own sensibilities, rather than out of consideration for the animals. 13 Fearful of a public outcry, the pioneers of animal experimentation imagined potential anti-vivisectionists around every corner, though, as with most other moral issues then and since, the majority of people remained stubbornly indifferent. It took histrionics to break through their complacency, and both sides obliged. Rather than repeat these recurring diatribes in every chapter, it will suffice to summarise them here. Vivisectionists, according to their critics, were cruel, sadistic, and even diabolical in their wickedness. There are, of course, no facts to support this; in reading many accounts, I have found nothing to suggest that any British vivisectionist derived perverse pleasure from his work. 14 So far as one can tell, all thought they were doing something that needed to be done, and many genuinely disliked doing it. As for the accusations that they were cold, heartless and indifferent, this they did not dispute, though they wrote cool, objective and scientific instead. For them, the whole point of the scientific method was that one was supposed to be dispassionate. In turn, experimentalists dismissed anti-vivisectionists as soft, sentimental, and womanish, accusing them of valuing other animals above their own species and hampering life-saving research because they were too weak to stomach the necessary experiments. They knew, in their hearts, that medical science must progress, but were too cowardly, or hypocritical, to help: no wonder some were also pacifists. Personally, I would consider most of the comments directed at anti-vivisectionists quite flattering if applied to me, and reassuring if applied to the doctor about to treat me. Some anti-vivisectionists acknowledged the same, but the culture of masculinity was strong in medicine and this, along with the high importance accorded to laboratory work, explains the otherwise surprising fact that many members of this quintessentially caring profession were driven to regard sentimentality as a weakness of character. Chapter 3 considers the importance of the theological and metaphysical status of animals for the anti-vivisection movement, particularly the question, now somewhat neglected but frequently raised in the nineteenth century, of whether animals have souls. Changes in praxis in Victorian Britain indicate that popular faith moved ahead of ‘official’ theology, as people mourned the deaths of animals and speculated on the possibility that humans and non-humans might share a common afterlife. It would be almost a century before most Christian denominations would seriously address this and other issues related to animals, and though many animal welfare projects were initiated with Christian intent, no mainstream church had much to say about the subject, and some defended vivisection. A perception of greater spiritual kinship between humans and animals arose, I suggest, through the influence of a variety of non-Christian sources, including classical paganism, esoteric philosophy, transcendentalism, and Western interpretations of so-called ‘Eastern’ religions, the same influences that, channelled through the utopian ‘new age’ organisations that sprang up around the turn of the nineteenth century, would eventually inspire the environmental movement. The connection between what I shall call ‘new age’ thinking and anti-vivisection stemmed from a shared rejection of the agenda of scientific materialism in favour of a holistic worldview, in which intuition and feeling were as important as observation and experiment. Chapter 4 looks at the ‘new age’ programme through the work of Josiah Oldfield, the founder and medical director of Britain’s first vegetarian and anti-vivisection hospitals, and secretary of the Order of the Golden Age—a Christian organisation committed, amongst other things, to health reform and pacifism. Oldfield was a campaigner for fruitarianism and anti-vivisection, and his career provides a case study of how medical opposition to cruelty was linked to aspirations for social and spiritual reform. His anti-vivisection hospital, a converted South London town house with only eleven beds was, as its critics eagerly noted, not intended solely for the benefit of its patients. Indeed, there were more vice-presidents than patients, the object being to attract sufficient public support to prove that an anti-vivisection hospital was a financially viable venture. 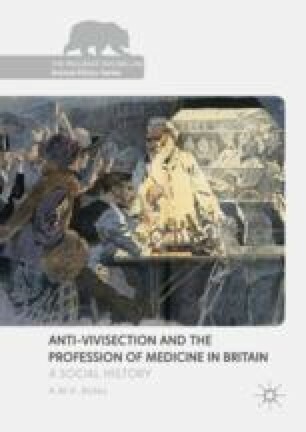 Chapter 5 surveys the work of the National Anti-Vivisection Hospital, which opened in 1903 and continued Oldfield’s project on a larger scale, challenging the state-sponsored ‘vivisecting’ hospitals and acting as a showcase for compassionate medicine. While it is likely that no animals were directly saved by the hospital’s existence, it did spare the anxieties of the local poor, who feared hospitals that permitted vivisection would not scruple to experiment on their patients. As a propaganda exercise it was a victim of its own success: advertised as the only hospital to which anti-vivisectionists were able to donate with a clear conscience, it was seen as a threat to the funding of other voluntary hospitals, and the King’s Fund, Research Defence Society and others instigated a financial boycott that forced it to close. Chapter 6 looks more closely at the vivisectionists’ response, particularly as mediated through the work of the Research Defence Society. Founded in the early-twentieth century by a group of physiologists who advised the government on granting vivisection licenses under the 1876 Cruelty to Animals Act, it had far fewer members, and less funds, than any of the main anti-vivisection groups, but managed to exert disproportionate influence. Through astute political manoeuvring it blocked anti-cruelty legislation in parliament, curtailed advertising by anti-vivisection societies, and arranged for their charitable status to be revoked. Anti-vivisectionists complained that shadowy vested interests were conspiring against them, but it was their own links with fascist groups and their opposition to wartime research and vaccination programs that cost them sympathy and led the government and public to see their activities as unpatriotic and even treasonable. Chapter 7—After the Second World War, anti-vivisection languished as other untarnished social causes competed for money and support. This was the era of the National Health Service, and government control of medicine was also extended to drug testing. Lethal dose testing in particular led to a large increase in the number of animals used, mostly as part of standard drug testing protocols, which left experimenters no longer personally responsible for deciding what procedures they carried out. The deaths of animals specifically bred for the laboratory, in experiments reported only through the publication of official statistics, lacked the emotive impact of the public vivisections of companion animals that had given the anti-vivisection movement its early impetus. While most of the suffering was now hidden, a few well-publicised animal experiments in high tech contexts, such as the field of space exploration, accustomed the public to equate them with prosperity and progress. While I have tried to include in this book all the major events in the history of anti-vivisection in Britain from the nineteenth century until the 1960s, I have favoured some aspects that are less well covered in the classic studies by John Vyvyan, Richard French, and Nicolaas Rupke (to which the reader may wish to refer), and have focussed on the underlying ethical concepts and social trends at the expense of providing detailed histories of the major anti-vivisection groups and their leaders, as these are, happily, becoming quite well known. 16 I have not described vivisection experiments in detail, because it is not my intention to write a scientific history of vivisection, nor to turn the reader’s stomach. Vyvyan’s work has been a particular inspiration, and I have followed his lead in that, while striving to be accurate and to do justice to the arguments on both sides, I have not pretended to be dispassionate about the events l describe. Indeed, it would be wilfully obtuse to write so much about the virtues of sympathy and compassion and then affect indifference to the infliction of so much suffering over so many years. Throughout the text, ‘animals’ is used for ‘non-human animals’, lest repeated iterations of the latter phrase become wearisome. Justin Oakley, ‘Virtue ethics and bioethics’, in Daniel C. Russell (ed.) The Cambridge Companion to Virtue Ethics (Cambridge: Cambridge University Press, 2013), 197–220 (Oakley 2013). Alberto Giubilini and Francesca Minerva, ‘After-birth abortion: why should the baby live?’, Journal of Medical Ethics, 39 (6), 261–263 (Giubilini and Minerva 2013). Julian Savulescu, ‘“Liberals Are Disgusting”: In Defence of the Publication of “After-Birth Abortion”’, http://blogs.bmj.com/medical-ethics/2012/02/28/liberals-are-disgusting-in-defence-of-the-publication-of-after-birth-abortion/, viewed 5 March 2016 (Savulescu 2016). The Oxford English Dictionary defines ‘humane’ as ‘such behaviour or disposition towards others as befits a man’, the sense in which it is used in this book. Peter Singer, ‘Animals and the Value of Life’, in Tom Regan (ed.) Matters of Life and Death: New Introductory Essays in Moral Philosophy (New York: Random House, 1980), 218–259, on p. 254 (Singer 1980). Tristram Stuart, The Bloodless Revolution: A Cultural History of Vegetarianism from 1600 to Modern Times (New York, W.W. Norton, 2007, 71–72 (Stuart 2007). Stanley Godlovitch, Roslind Godlovitch and John Harris (eds) Animals, Men, and Morals: An Enquiry into the Maltreatment of Non-Humans (New York: Taplinger, 1972); Peter Singer, Animal Liberation (London: Pimlico, 1995), 270 (Godlovitch et al. 1972; Singer 1995). Andrew Linzey, Animal Theology (London: SCM Press, 1994), 20, 41–42 (Linzey 1994). ‘The non-alcoholic treatment of disease’ BMJ, 1 (1878), 830–831 (The Non-alcoholic Treatment of Disease 1878). John Vyvyan, In Pity and in Anger: A Study of the Use of Animals in Science (London: Michael Joseph, 1969), 7 (Vyvyan 1969). John Simon, ‘An Address delivered at the opening of the Section of Public Medicine’, BMJ, 2 (1881), 219–223, on p. 223 (Simon 1881). Rob Boddice, ‘Species of compassion, aesthetics, anaesthetics, and pain in the physiological laboratory’, Interdisciplinary Studies in the Long Nineteenth Century, 15 (2012), 19 (Boddice 2012). As there were apparently no female vivisectionists in nineteenth-century Britain, I have employed the male pronoun, as to do otherwise would be to accord women a false equality as ahistorical as it is unflattering. See Ruth Richardson, ‘A necessary inhumanity?’, Medical Humanities, 26 (2001), 104–106 (Richardson 2001). R.D. French, Antivivisection and Medical Science in Victorian Society (Princeton, NJ: Princeton University Press, 1975); Nicolaas A. Rupke (ed. ), Vivisection in Historical Perspective (London: Routledge, 1990) (French 1975; Rupke 1990). Savulescu, J. (2016). “Liberals Are Disgusting”: In Defence of the Publication of “After-Birth Abortion”. Retrieved March 5, 2016, from http://blogs.bmj.com/medical-ethics/2012/02/28/liberals-are-disgusting-in-defence-of-the-publication-of-after-birthabortion/.